I wrote this review over a year ago but given the general state of Western Europe I felt it needed to be posted again. I can't recommend this book enough if you want to understand why the European people refuse to reproduce and prefer to import people from other regions. Nothing is more telling regarding the state of affairs in Europe that author Douglas Murray, an open homosexual, laments the loss of Christendom in his new book The Strange Death Of Europe: Immigration, Identity, Islam. This is one of the most powerful books on the topic of mass immigration and cultural cohesion and perhaps Murray's status as a member of one protected class gives him some cover to criticize Islam and Europe's suicidal immigration policy, although that didn't save the life of Pim Fortuyn, an early sacrificial victim on the altar of cultural enrichment. Or perhaps he is like so many others and just no longer cares. Either way The Strange Death of Europe is a piercing clarion call for the slumbering and apathetic people of Europe to wake up and at least start asking the hard questions. The question Murray himself ponders repeatedly is this: can you continue to flood Europe with people that do not share European liberal values and don't seem interested in adopting them and expect Europe to remain the same? The answer is obvious except to the Angela Merkel's of this world. Murray spends a great deal of time examining the mindset of Europe in the century since the end of World War II and describe what I saw as a broken, exhausted people that are tired of fighting and just waiting to die a death they think they somehow deserve because of past sins of dead people, real and imagined. There is some truth to the evils that have occurred in Europe but it is not true that these were unique to or especially worse in Europe. Other cultures may not have been as efficient as Europeans but their relative lack of "success" is not for the absence of trying. Europe's basic problem is that too many European elites see nothing in Europe worth preserving so why not hand the keys over to new people? As I mentioned, the big problem with that mindset is that there is absolutely no reason to think that the features of Europe that make it so enticing will continue on in perpetuity when Europeans are a minority or extinct. If you look at a list of nations dominated by Islam you would be hard pressed to find even one you would want to live in thanks to oppressive laws and cultural norms. When Islam replaces Christendom why would you expect a different result simply because of a change in address? One of the most troubling and infuriating aspects of the book are those places where Murray ponders why so many "leaders" insist on a suicidal policy of mass immigration in spite of the widespread disapproval of the people and the evidence that it is proving to be a disaster. Murray posits two possible initial explanations. One that it is a complete surprise to people that had no idea what would happen because they lacked any foresight. The other is that it is a calculated effort to replace Europeans. I am not sure which is more troubling, but I tend to lean toward the latter as closer to the truth. The question of why no one wants to do anything about it raises the notion that political leaders know it is a disaster but that it is too late to do anything about it so they just seek to maximize the political benefits to themselves for as long as they can. Murray is a masterful story teller, even in places like late in the book where he discusses the sorry state of European art and culture by referencing stuff I haven't a clue about and where he tends to get a little esoteric. He weaves together the story from the end of the Second World War to today and puts a lot of the pieces together than I was unaware of. Along with lengthy expositions he also has a ton of quotable tidbits including these two exactly 300 pages apart at the beginning and near the end of the book. Those two quotes pretty well sum up the issue. Europe has no sense of self-preservation even to the simplest degree of reproducing themselves and yet is engaged in a course which is importing the world's problems without a thought for what that will mean for the continent. 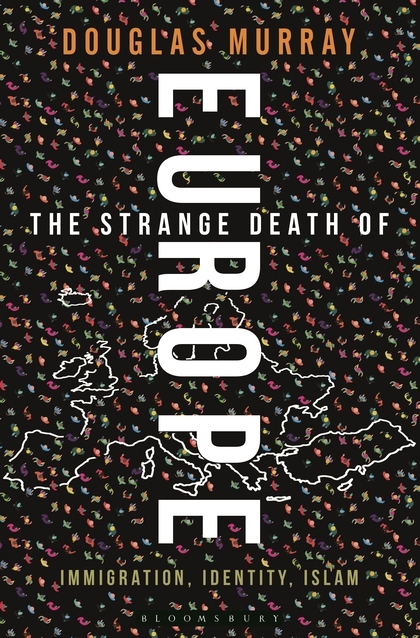 Douglas Murray has created an important work with The Strange Death of Europe. I just hope it is read by enough people in time to save Europe from herself. While Murray proposes a few possible scenarios for the future, I think there are only two. One that he suggests is that future Europe looks like a massive United Nations meeting and native Europeans retreat to enclaves and rural areas that immigrants shun. The other is something far worse rising up in response to mass immigration. Sooner or later I am afraid something really major is going to happen and terrorists in Europe will get their own "home run" like 9/11. The slow, almost daily, trickle of terror is easier to shrug off but what happens if the death toll is not in the dozens but the thousands? What will happen then? One way or the other Europe is going to be very different in the next ten years. Hopefully voices of reason like Murray will lead the way. 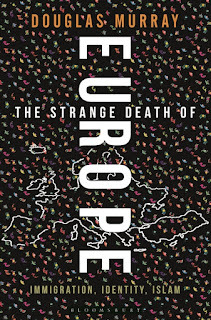 The Strange Death of Europe by Douglas Murray is one of those rare absolute must-read books, especially for those concerned about the big questions of culture and civilization.